Just a short post about an outfit I made over the past two days. I needed a break from the Royal Suit, and decided to make a summer outfit. 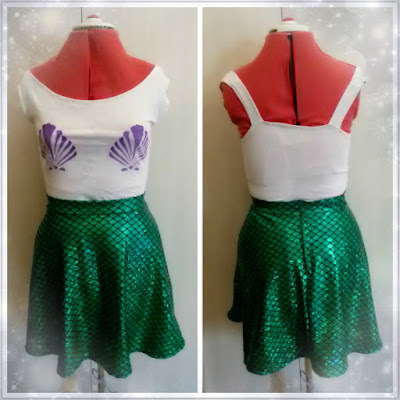 I had this beautiful green mermaid fabric, and I wanted to make an Ariel inspired look (my very first cosplay was Ariel, so this is also a nod to that). I used an existing skirt to create a pattern for this one. I traced the pattern on to the mermaid cloth, cut it out, and sewed the pieces together. I added a waistband, then a zip for closure. Originally I wanted to have pockets, but they gaped open and looked so ugly that I got rid of them. One day I will learn how to make pockets that do not gape open. I made from crop top from an old, cut up t-shirt. The resulting top is a bit wonky, but at least it looks nice from the front.